We offer a large range of Ropex Resistron RES impulse heatseal temperature control units, to minimize your down time, and eliminate non-compliant repairs. 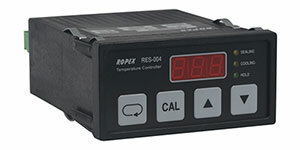 All Force Global controller repairs are performed by Ropex service technicians. ROPEX and RESISTRON are Registered Trademarks of ROPEX Industrie-Elektronik GmbH, Germany. Resistance Engineered Sealing Technologie™ (2012) is a Trademark of Force Global, Inc. Copyright © 2000 - 2018 Force Global Inc. All rights reserved.